The 12 gauge is one of the most effective rounds available. With its massive firepower and incredible versatility, the 12 gauge is a superb option for close range self defense, hunting, and sport shooting applications. 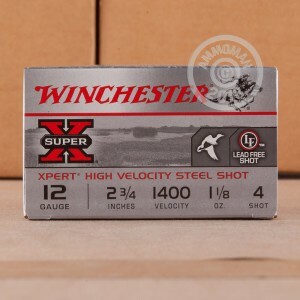 Whenever you want high quality ammunition, Winchester is always there for you. Founded in 1866, Winchester has been producing high quality firearms and ammunition that generations of Americans use and trust. 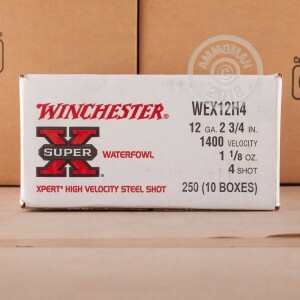 With these Super-X, Xpert steel shot shells, you have an affordable option for waterfowl hunting. 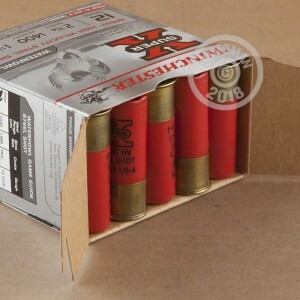 Each hull in this box of 25 measures 2-3/4" and caries a 1-1/8 ounce payload of #4 steel shot. You can expect to see around 1,400 feet per second with these high velocity shells. Do you need to stock up for the season? At AmmoMan.com all orders over $99 will receive Free Shipping!